Photography: Ali Elai of Camerarts, Inc.
One of the most celebrated and distinctive objects in the Museum of the City of New York’s Toy Collection is the Stettheimer Dollhouse, made between the world wars by Carrie Walter Stettheimer (1869 – 1944). The dollhouse reflects a remarkable life lived during a remarkable time in the city’s history. Along with her mother Rosetta and two of her sisters – Florine (1871 – 1944), an artist, and Ettie (1875 – 1955), a scholar and writer – Carrie hosted one of the most notable literary and artistic salons of early twentieth century New York society. The Stettheimers’ sophisticated gatherings brought together a vibrant group of modernist intellectuals and artists of widely varying backgrounds, among whom were leading avant-garde painters, writers, and musicians, both Americans and European émigrés. …Over the course of almost two decades, Carrie devoted what spare time she had to decorating the dollhouse’s interior, transforming it into a three-dimensional work of art. Ettie later said she believed the dollhouse served as the outlet for Carrie’s artistic expression, a substitute of sorts for the career she aspired to in set design… Etti’s conjecture proves exceptionally revealing, and in this light the house may be seen as a series of fully conceived and executed stage sets, each awaiting the entrance of the players. …Unlike most dollhouses, which are played with by children, this one was intended to be appreciated by adults, even by connoisseurs of art. It’s decor reveals the sophisticated sensibility of its creator, combining different styles in the eclectic taste that was the epitome of New York fashion in the 1920s. 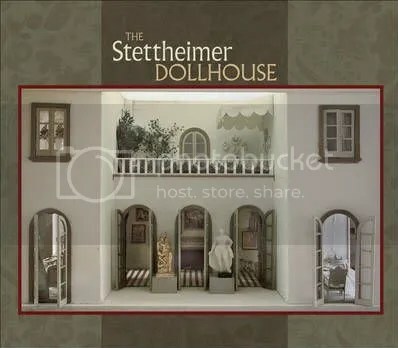 The Stettheimer Dollhouse by Sheila W. Clark is a darling little informative book about one of miniaturists favorite buildings. Complete with near-impossible photography, this book brings the dollhouse’s minute details into focus, from the weave of the needlepoint rugs to the optical illusions of the foyer wall decor. I was continually delighted and impressed by the room by room descriptions and pictures. My first reaction when I pulled this sealed book from the mailing envelope was childlike wonder. I quickly tore the plastic wrap off of it and began to flip through, examining each beautiful image after the next. Maggie peeked and peeped with excitement over my shoulder and is now intent on buying her own dollhouse from a soon-to-open pawn shop here in town. The Rose Bedroom is one particularly adorable room we’ve both decided to live in. If the impressive photos weren’t enough, the story behind the house is a rather interesting one, too. The only complaint I could possibly have about it is that the writing is a bit dry. Honestly, though, I wouldn’t expect anything could change that. I’d expect it’s rather difficult to describe chintz, chiffon and taffeta an keep your readers riveted, so I won’t hold that against the book. Quite a joy of a book, and Maggie won’t let me mooch it away 😉 I give The Stettheimer Dollhouse by Sheila W. Clark 4 out of 5 stars.